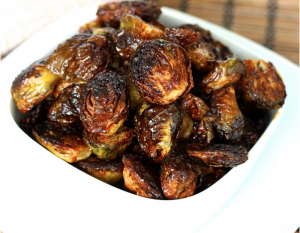 Brussels sprouts are one of my favourite items for a side dish. They are very versatile even though the family complains about the after effects of cruciferous vegetables… 🙂 . I have blanched them, followed by sauteeing them in butter with chopped Walnuts, shredded them into ribbons and steamed sauteed them with grated coconut a la Souther Indian, aka Tambram style and many more. This one is a roasted variety. They should be Golden brown at the center but nicely charred with some crispiness to the outer leaves. During the last 15 – 20 minutes of the baking combine the rest of the ingredients and reduce on top of the stove on medium to high heat until reduced, thickened and syrupy. Toss the Brussels sprouts in a bowl with enough of the sauce to coat it. You don’t want excess sauce to make them soggy. I have sometimes enjoyed this dipping sauce tossed with sauteed cabbages. It is also quite good on roasted Cauliflower.